Australian Greens announced their support to Melbourne's Greek Community (GCM) and its programs. 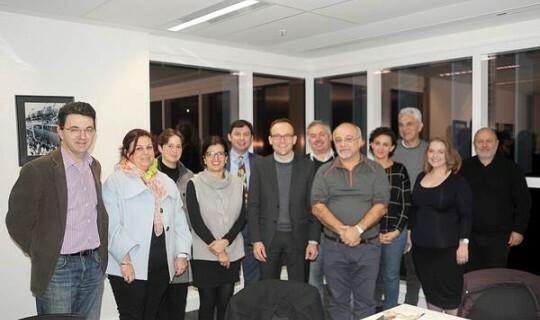 The announcement was made by the Australian Greens federal member for Melbourne, Adam Bandt, during his visit to the Greek Centre, on Monday 27 June, where he met with members of the GCM Board. Present at the meeting were the Board Members: Costas Markos, Leonidas Vlahakis, Tammy Iliou, Voula Kallianis, Vasso Zangalis, Theo Markos and George Koletsis, as well as staff members including: Jorge Menidis, Penny Kyprianou, Aleena Glentis, Manos Tzimpragos and Stavros Messinis. GCM’s Vice President, Theo Markos, and Jorge Menidis, director of the Greek Centre, explained to Mr Bandt the educational and cultural programs of the Greek Community. Mr Bandt expressed his full support for the government funding the Greek Community is seeking for these programs. During the meeting a number of other issues were discussed that concern the Greek-Australians and which were included in a statement of claims the GCM submitted to Australian political parties before the elections. Mr. Bandt stated that he was impressed by the work of the Greek Community and that his party will support GCM’s programs and activities. Theo Markos expressed his satisfaction with the outcome of the meeting, which followed similar meetings with delegations of the Liberal-National Coalition and the Labor Party, who both promised to fund with $590,000 the GCM educational and cultural programs. "Our community, as an organization that cares for the needs of the Greek community, has the responsibility to make contact with all political parties that play an active role in everyday politics of our country. We hope that the discussions we recently had with the three main parties will continue after the elections." The Greens believe there needs to be increased resource allocation for the teaching of indigenous and community languages in public primary and secondary schools. The Greens have committed $10 billion over four years for needs-based resourcing of schools to ensure each child receives thesupport they need, and each school is able to provide the best possible curriculum to meet community needs. The Greens are committed to developing a national legislative framework on multiculturalism, as set out in our comprehensive approach to multiculturalism. This can be found at http://greens.org.a u/m u lticulturalism. National legislation on multiculturalism would not only recognise the enormous contribution of migrant communities to Australian life, but also work as a base from which to enhance and protect rights and opportunities of multicultural communities. Legislation like this has been demonstrated to be a success in countries like Canada. The Greens will commence a national stakeholder consultation to develop this national framework through establishment of a Joint Select Committee, ensuring the voices of the community and key stakeholders are heard. A national legislative framework would be a critical step in taking a whole-of-Government approach to multiculturalism, embedding these principles across all the work of various Departments, and making it clear as a priority of Government. The Greens are also committed to moving multicultural affairs back into the Department of Prime Minister and Cabinet. This is the best means of driving a whole-of-government approach to multiculturalism across various departments. • Develop a national strategy for mature age workers. • Provide increased job active support for peopled aged 45+ looking for work. • Remove legal barriers to mature age employment. • Oppose Coalition cuts to aged care. The Greens will oppose Coalition cuts to the Aged Care Funding Instrument (ACF\). • Develop a plan for full consumer directed care. Working with industry, consumer groups and other stakeholders, the Greens will develop a clear roadmap to implement consumer directed aged care. • Develop a national aged care workforce strategy. The Greens initiated and were chairing a Senate inquiry into the aged care sector workforce, and will work with stakeholders across the sector to develop a strategy for the changing nature of the aged care sector. The Greens have been strong supporters of the role public and community broadcasters play in broadcasting in languages other than English, and believe that this important voice most be heard through a national broadcasting policy. The Greens have consistently opposed cuts to services such as the SBS and community radio and television, which provide a vital service in broadcasting in languages other than English, as well as catering for a level of cultural sensitivity that other networks cannot. Ensuring that funding is restored is paramount, to allow services to continue to provide this important cultural service. people in cruel camps on Nauru and Manus Island is at a stalemate with people continuing to languish in detention with no meaningful prospects of resettlement. The Australian Labor Party offers no genuine alternative to the government as they are committed to maintaining the detention of people (including children) in offshore camps and boat turn-backs. The Australian Greens offer a unique proactive alternative for the fair and efficient assessment and resettlement of people seeking asylum which ensures they are treated with respect and dignity and integrated into our community. Importantly, the Australian Greens policy will ensure that people's safety is paramount. By increasing our humanitarian intake and adequately funding organisations in the region, the Australian Greens will create a fair system whereby people's claims are processed efficiently and they are flown to Australia from Malaysia and Indonesia. People will no longer face the impossible choice of getting on a leaky boat. Importantly, the Australian Greens will close the cruel camps on Nauru and Manus Island.